I think, no matter your age, you can’t help but stare in child-like wonder at vast stone fortresses and crumbling ruins of old. Many a boy has dreamed of being a knight, and almost every little girl has dreams of being a princess. I must admit, even as an adult, it is very hard not to imagine yourself in those roles whilst standing amongst towering stone walls. There are so many questions to be asked – Who has stood where I am standing now? What events have taken place within these walls? How much blood was shed here during the more turbulent times that almost every castle has seen. This is just as evident at the Rock of Cashel (the name comes from the Irish caiséal, which means stone fort). This spectacular group of buildings is perched on a 200 ft outcropping of limestone and features a “round tower” (one of many found throughout Ireland), a High Cross and Romanesque chapel, a castle, and the restored hall of the Vicars Choral, all of these ranging in age from the 12th century to the 15th century. Warriors, chieftains, kings, princes, saints and bishops have come to claim this as their seat of power, and the energy and power of the place is palpable. Every stone, every carving has a story or two to tell. There is even a small museum with a few ancient relics. The myth of the origins of the rock is as follows – The devil took a bite out of a mountain 30 km to the north (called the devil’s bit) and in the process he broke his teeth. The bit that fell from his mouth became the rock upon which this Medieval cluster of buildings stands. This is also reputed to be the site of the conversion of the king of Munster to Christianity by St. Patrick, and thus became the traditional seat of the kings of Munster for several hundred years prior to the Norman invasion. The rock has even stronger associations with Ireland’s most famous secular leader, the great and daring warrior prince Brian Boru who was crowned king of Munster in 977. Twenty-five years later, after uniting the four kingdoms of Ireland against the Vikings, he was crowned high king of Ireland and the cashel served as his home fortress. Brian Boru was a son of Cenneide, a king of Thomond in Ireland (later known as Limerick). He passed his youth in fighting against the Danes, who were constantly ravaging Munster, the northern part of which district was the home of Brian’s tribe, and he won much fame in these encounters. In 976 his brother Mathgamain, or Mahon, who had become king of Thomond about 951, and afterwards king of Munster, was murdered; Brian avenged this deed and became himself king of Munster in 978, and set out upon his career of conquest. Thus his first coronation to any type of kingship most certainly took place on the Rock of Cashel. Brian forced the tribes of Munster and then those of Leinster to accept his sovereignty. He defeated the Danes, who were established around Dublin, in Wicklow; he marched into Dublin, and after several reverses compelled Malachy, the chief or high king of Ireland, who ruled at Tara in County Meath, to bow before him in 1002. Connaught was his next objective. Here and also in Ulster he was successful, and everywhere he received hostages and tribute. Though we know of no further official coronation, Boru was generally recognized as the ardri, or chief king of Ireland from 1002 onward. While it might seem fitting to be coronated as high king on the Hill of Tara, there are those who believe he returned to the Rock of Cashel, where he was crowned High King of Ireland. After a short period of comparative quiet Brian was again at war with the Danes of Dublin, and, on the 23rd of April, 1014, his forces gained a great victory over the Vikings at Clontarf. Awhile after this battle, however, the old king was slain in his tent, and was buried at Armagh. In 1101, Muircheartach ua Briain (great-grandson of Brian Boru) donated his Rock of Cashel fortress to the church, and thus it’s new beginning as a place of Christian worship. 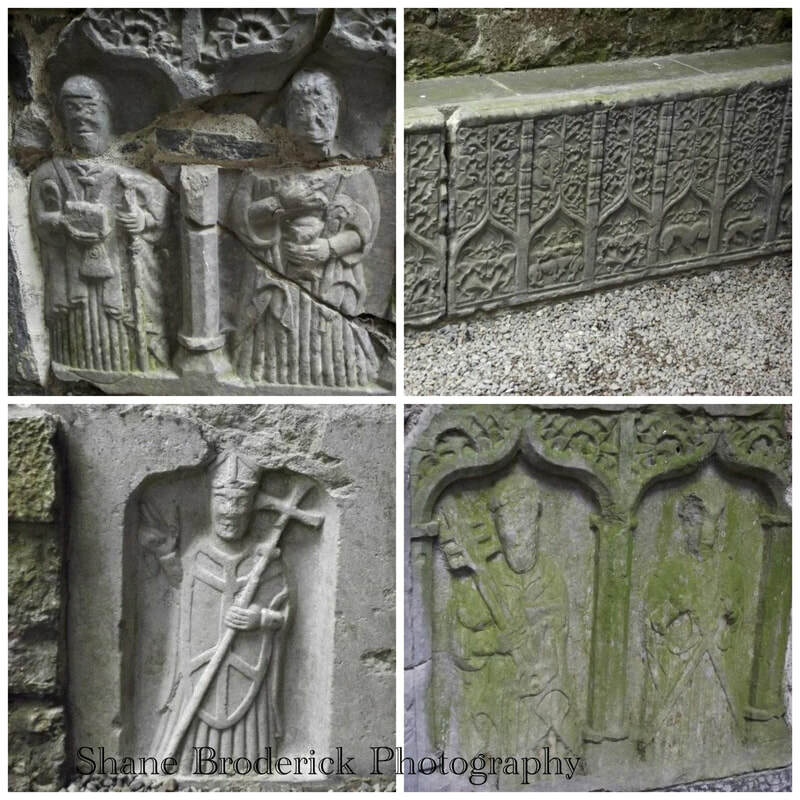 The Romanesque chapel (Cormac’s chapel) was built by King Cormac Mac Carthaigh (McCarthy) and contains some of the best preserved frescos of its time, plus a Scandinavian style sarcophagus. It was one of the main reasons I wanted to visit the rock, but sadly it was closed due to renovations when I went there. A very large section of it was closed or covered due to extensive restoration. The scaffolding prevented me from seeing the place in its full glory, but as much as it filled me with sadness, it also filled me with joy because at least that bring another new beginning for the Rock, and I can rest assured that it will be preserved for many more generations, so they, too, can look in wonder at this ancient marvel. Many more boys can dream of being knights and many more young girls can dream of being princesses as they walk the halls of this once magnificent bastion. I strongly recommend that, if ever the chance arises, you should visit this beautiful place. I, for one, cannot wait for my next visit!